OSWEGO, NY – Last year’s Bridge Street Run seemed to be the event to end all others, and apparently it did. 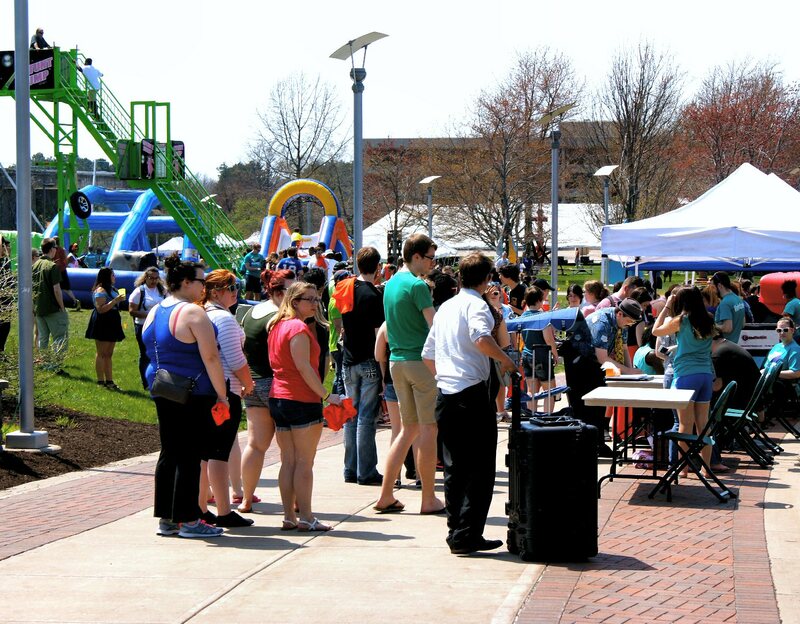 To combat participation in the BSR this year, SUNY Oswego’s Student Association Programming Board and the Student Association created OzFest. OzFest offered plenty for students to do on campus. From 2 to 6 p.m. free activities, including bungee jumping, stuff-a-buddy, a mechanical bull, and a dunk tank booth, to name a few, were offered to students, along with free food from the school’s auxiliary services. And college students, many of which will graduate with a substantial amount of debt for a degree that will not land them a job in their field of study, appreciate free stuff. On top of the free activities and food, SAPB and the Student Association also brought big name artists Big Sean, Mac Miller, B.o.B., and Timeflies to the school with the disclaimer that students were not permitted to bring alcohol and that students who appeared drunk would not be permitted entry into the concert. Now, I have faith in my fellow students’ ability to be intoxicated without it being obvious, so undoubtedly the latter rule was written in vain. Even the scene along Water Street around 7 p.m. was subdued this year. Although, on campus, before the actual day of Bridge Street Run, students were all in agreement that the college had gifted them a near-perfect BSR. It seemed that most students would attend OzFest, BSR and the concert. Even longtime residents were skeptical. 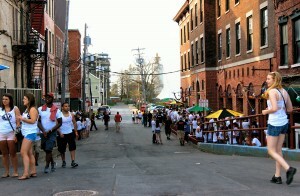 However, oddly enough, OzFest and the concert not only kept most students on campus, but also reduced the number of participants in Bridge Street Run dramatically. Even with some students taking advantage of OzFest before heading to the bars, the number of white shirts on Bridge Street was so few that by nighttime one bar eliminated its cover charge to entice students to come inside. Students also had the privilege of elbow room in all of the bars, an elusive thing that is rarely available during non BSR weekends. 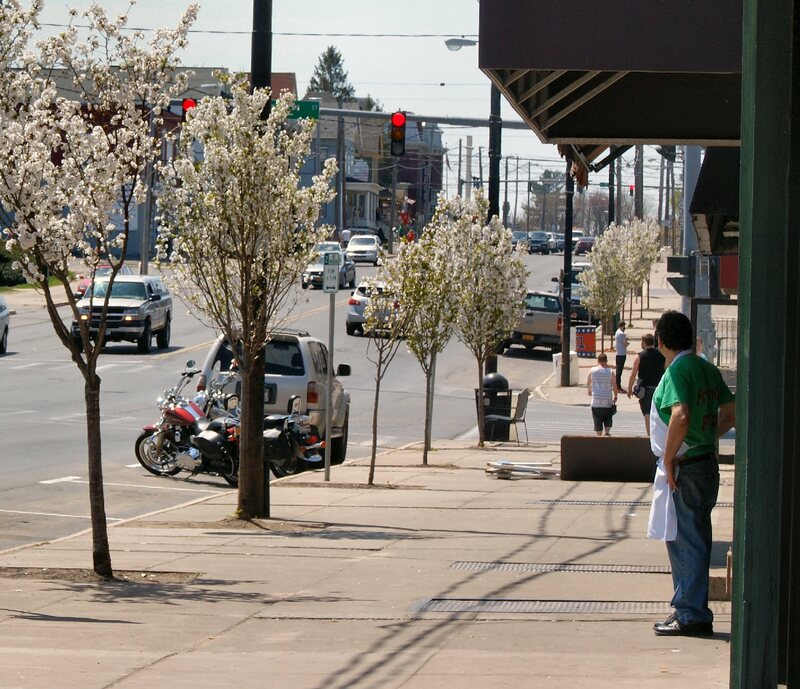 A pizza shop employee stares up Bridge Street around 3:30 p.m.
All in all, BSR looked like a normal day. The suffocating sea of white T-shirts from previous years seemed like nothing more than a distant memory. Furthermore, not only were the numbers fewer, but, from what I observed and from local reports, violent activity was kept low. From my time on Bridge Street during BSR, it appeared that most students had gone out of their way to disprove the opinions of locals by peacefully participating in BSR and saving their excited behavior for the bars. 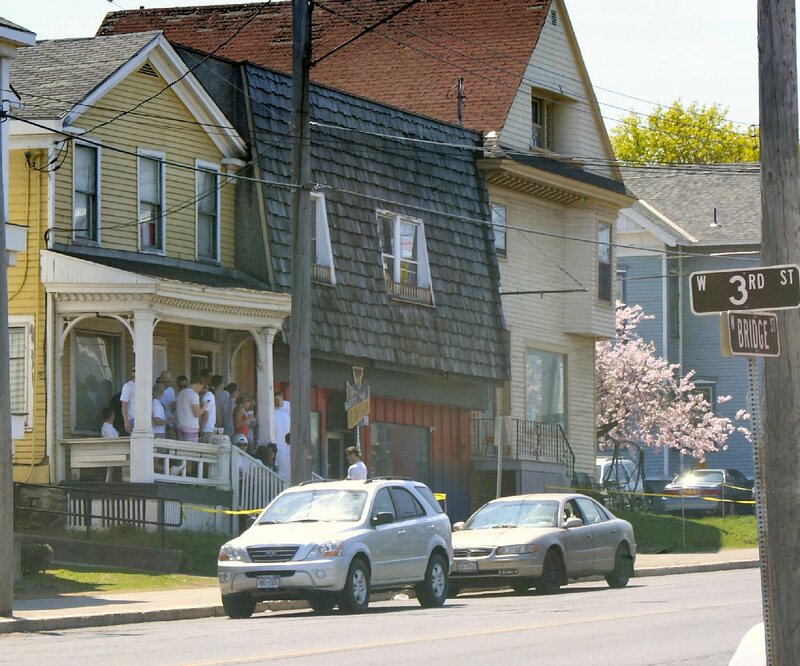 Fraternities and student houses even posted “Must be 21 to drink” signs. Additionally, students were seen having friendly conversations with Oswego police, all of which were not only pleasant, but approachable and extremely visible on all of Bridge Street. There were some gatherings at houses along Bridge Street. I can’t help wanting to congratulate the college, specifically SAPB and the Student Association on a successful beginning to ending BSR entirely. Apparently, it’s not preventing the purchase of white T-shirts that ends longstanding traditions, it’s free food and teddy bears. And honestly, most students would have to agree that receiving free things is a much better way to end the semester than paying money for watered-down alcohol served in tiny plastic cups. Here’s to next year, another successful OzFest, the chance to dunk the group members who failed you at the dunk tank booth, and mending the college’s relationship with its greater community. It is so wonderful to see SUNY Oswego live up to it’s great academic community reputation, rather than occasional, “party college” name. The Bridge Street Run has been a tradition at Oswego for fifty years (I did it myself in the 1970s). We had 103 bars in Oswego, and it was a joke that you could visit them all before you graduated (the secret was that you drank a third of your beer, and then went on to the next one. NO one tried to drink a whole one, well, almost no one). Sadly, it hybrided into ‘something else’ a whole lot less attractive. Great intelligent, friendly students morphed into a beastly creature, throwing up and urinating on the neighborhood’s streets (and bushes, porches, etc.). One year we got up to let the dog out at 4 AM, to find a young woman seated on our porch furniture, so inebriated she didn’t know where she was. She left a camera behind we were never able to return to her. We would have called a cab on us, but my husband said by the time he came to get me (not too good for a guy to be trying to help her at that hour), she was gone. We hoped we wouldn’t hear about her on the news next day. We didn’t…thankfully. In the 1970s/1980s/into the early 1990s, students stayed on campus for some really memorable events. I remember in grad school having THE most popular Blood Sweat and Tears tribute band play in the quad outside Penfield and between Hewitt Union. 14 instruments and nice and LOUD!!! :0) B-B-Q and non-alcoholic beverages…a great afternoon of sun and stress relief before finals. Nice to see SUNY offering this sort of thing again. About time you guys!!! I’m glad!! I caught a boy urinating in my scaevola garden last year. Such a shame! Joe & I always used to have an extra Bud Lite with dinner on BSR to join in on the celebration :-) LOL! I miss him. Ms. Christine Scriber, what a well written and informative article. You did a out standing job, we are all so proud of you. Keep up the good work and may God Bless you. Regards, The Frederick Family from Potsdam, N.Y.
We’ll have more from Ms Scriber coming up in the near future. Thanks for the note!